As usual, you’re talking with your friend about books. “Have you read it?” she asks. “No,” you say, “but it’s on the nightstand.” It’s on the nightstand. That’s code for, I’ve made mental note of it. Or It’s on my list but not a priority. Or even, I actually own it, and I’ll be reading it next. Regardless, for me, It’s on the nightstand has always been metaphorical — an abstract and elastic category of Books I Hope To Read. You could call it an “alcove,” but it’s not big enough for a queen-sized bed. The full-sized has worked just fine, but the piles of unshelved books — on the floor, on the dresser, on the dining chairs, in the bathroom, on top of the puppy crate for godssakes — haven’t. I wanted a nightstand. And so, an end table was repurposed. Finally, I have an actual nightstand. What’s on the nightstand? Suddenly the question is not so abstract. Of the mess of books that has been unsystematically scattered throughout my home, and my life, which ones will make it to the nightstand? In what order will they be stacked? Perhaps most importantly: how will I decide? A mini-debate recently bloomed among colleagues at the college where I teach, after the department administrator sent around a brief and innocent-enough email: would we please send changes or additions to the attached post-grad Suggested Reading List? The list, she reminded us, would be distributed to graduating seniors; a deadline was specified. To go from one book to another all by themselves. It sounds simple enough. As a young person just entering the world of post-academy literature, the challenge may be discerning “what’s good.” In youth, there is a blessed naiveté about this, a hunger for objective, definitive recommendations from an authoritative source. In graduate school, when a professor first challenged me to “create your own map of literary influences,” it was indeed a revelation: the image I remember conjuring was of lily pads — each of us in our own deep black pond, bug-eyed and hopping from one pad to another. Sometimes just one pad over, sometimes a greater leap to the far shore. Apparently random, and yet mysteriously considered. As we get older — as the nature of our work and passions specifies, as our aesthetic palates grow more particular — we understand that, given the sheer number of artful and compelling books in the world relative to the time we have on the planet, “good” is more contextual than absolute. Deciding what to read next is thus as much about Knowing Thyself as Knowing Literature. School attempts to teach the latter; it’s the self-knowledge that we must develop on our own, over time. And so, in my humble opinion, the process by which you decide what to read must not be outsourced — to your professors, to reviewers or awards, to online algorithms. An external source can’t tell you what you need to read next any more than a spouse can tell a pregnant partner what she’s craving to eat; what will satisfy. Read what you want and when you want. Choosing what to read is about attuning yourself to what it means to be nourished. By this I mean confronted, changed, filled, emptied, engrossed, surprised, instructed, consoled — all these. You. At this moment in time. What should I read next? It is not a casual question. We are not frogs. We are chasing something more profound than flies. Every time I finish a book and consider what to read now, it feels…important. Standard trial run. I bought the book on impulse; it’s been lying around for a while. I pick it up and start reading. Am I eager to read page 26 (even better: did page 26 come and go without my noticing)? Am I stopping to scribble in my notebook because the book is sparking responses that matter enough to write down? Or — have two paragraphs gone by and I don’t know what I just read (in which case something is evidently not clicking). Okay, the truth is, I bought three books on impulse. I lay them out side-by-side. I stare at them. Which one should get the trial run first? I stare some more. I pick up each one, feel it in my hands — heft, cover material. I look at the cover for some time. Sure, there is that two-second impression; but there is also the three-minute study and consideration. The emotions and ideas it evokes. I skim the jacket copy but not too closely. I am not interested in the publisher’s sell job but rather words or phrases that resonate, with me, right now, for whatever reason. I lay them out again. I wait. I swear to you, one of them starts to levitate. As reader, writer, and teacher, for me, narrative POV is perhaps the most intriguing, and most important, feature of any work of fiction. Usually, I am primed for something specific: first person or third person; omniscience or (in James Wood’s terminology) free indirect style; vernacular or formal, contemporary or non-contemporary; verbal density or spareness (the author who achieves these simultaneously always wins). When narrative voice is a driving factor, three or four pages is usually enough to determine Yay or Nay. Do I want to hear this voice speaking for the next two days or two weeks? Do I need a voice I can “trust,” insightful and articulate? Or something less stable, a wild and deeply subjective ride? I’ve just finished a book, and I’m on a reading roll. I stand in front of my bookshelves. Like yours, mine are “organized” in a particular way that would make very little sense to anyone else. I change up this organization from time to time, and sometimes this staring prompts reorganization. Sometimes the reorganization becomes part of the process of choosing — handling the books and moving them around as a way of reorganizing my mind. At the moment, there is the not-yet-read section. But I stare at the whole canvass of books, not just that one section. The book I’ve just read is still buzzing in my mind; if it was great, it’s buzzing in my body, too. I want more of that buzzing, but differently. The last book did X so well, so interestingly. I’m intrigued by X’s impact and also interested in how X would read if it was plus Y and minus Z.
I step back, lean in, repeat. I swear to you, one of the books starts to vibrate. This is the most exhilarating — like falling love. The last book did X. I want more and more and more of X. I am learning something here, seeing something new, growing intimate with characters and ideas. Maybe I haven’t identified what, exactly, was so captivating, so I read on to find out. More, more, more. Sometimes I’ll read them in order of best reviewed to worst reviewed; sometimes vice versa (reading the supposedly minor works of a favorite author can be particularly illuminating); sometimes chronologically; sometimes via the three-book shell game. I do keep wishlists, haphazardly. Or, I used to. When I’m stumped, I’ll log on to Goodreads or Audible and see what, at some point in time, I decided I might someday like to read. Then I proceed with Item D above, the online version of bookshelf staring. With audiobooks, a two-minute sample is usually available — the audio version of the 25-page test combined with the narrative voice test. I really should read Thackeray. I really should read Vollman. I really should read The Goldfinch. Well, maybe. I was glad I pushed myself to read Faulkner and Proust and To the Lighthouse; less so Philip Roth and Portrait of the Artist as a Young Man. I’m still pushing with Thomas Mann, the verdict is out. It’s good to ask yourself why you should read it. So you don’t feel stupid in a workshop or at a cocktail party? Or maybe because your favorite author from Item E above was deeply influenced by it. There are better and worse reasons for force-reading. If you are a professional literarian of some sort, there are more “shoulds” to contend with: you must teach, review, converse about certain books. I’ve been fortunate to “have” to read Jean Stafford, Esther Freud, Henry James, Carson McCullers, Giuseppe di Lampedusa, Steven Millhauser, Miranda July, Sherwood Anderson, on and on (in the cases of Lampedusa and McCullers, it led to Item E). In other words, there is certainly such thing as benevolent authority, and required reading can be a blessing (that is, when it’s not a curse). This, I confess, is one of the least successful categories. It’s not that my friends don’t have good taste. That many of them are thoughtful and discriminating readers may be the very problem: their passions are as contextual and idiosyncratic as mine. It would be, in a way, a little weird if the books they raved about were books that I would rave about, at the same moments in our lives. (Recommendations seem to work better, I find, when a friend talks about something he read some time ago, within the context of current conversation — as opposed to, “I just read this great book!”). My shameless plug. When Lisa Peet and I started writing about “post-40 bloomers,” there was a sense of mission, of trying to bring an alternative perspective to the table. Little did we know how many important writers — important to us personally — we’d discover along the way. For me, to name just a few: Harriet Doerr, William Gay, Spencer Reece, Shannon Cain, Edward P. Jones, Virginia Hamilton Adair, W.M. Spackman, Robin Black. And don’t get me started on Jane Gardam (I cannot stop talking about Jane Gardam — Item E bigtime). Sometimes reading is about imaginative and intellectual expansion, the difficult pleasure that is, in the end, transformative and satisfying. But sometimes you have a reading window in which you want to treat yourself to an easier pleasure. Life is hard; you want to be carried away, both far and deep. As with physical nourishment, occasional dessert is as important for your health as kale. Endorphins or something? But let me be clear: a truly pleasurable dessert is still made of excellent ingredients, not junk. Me, I’ve been working pretty hard this summer; for this last week, I’m delving into Bring Up the Bodies. So, go throw darts at your bookshelves. Read 10 pages aloud. Stack up your wishlists. Read what you want when you want. If you don’t have one, get yourself a nightstand. I’m on a quest to surround myself with complex mothers. I’m going to seek them in novels, in stories I can enter during months when my own complexity seems to shine brighter. The women I’ll turn to can’t hear me when I talk back to them, but they can be my companions. I’m so fickle with What to Read Next. It’s really the only time in my life where I’m spontaneoud. The rule is, take your age and subtract it from 100. That’s how many pages you should read in any book before you decided whether or not to abandon it. I break that rule all the time. Life’s too short to read books you don’t like. One big difficulty in moving from book to book is style and tonality, especially when you are choosing with any of the methods Ms. Chung (and the rest of us, I suspect) uses above. The change can be jarring and off-putting, and often for me creating an unfair chance for the next book. I just finished re-reading Salter’s Dusk, then, after standing in front of the bookshelf, picked up Bellow’s Henderson the Rain King. Think of leaping from Hazzard’s Transit of Venus to Vollman’s Europe Central. Its like tripping and skinning a knee (alright, alright, alright, at my age its more like tripping and breaking a hip). 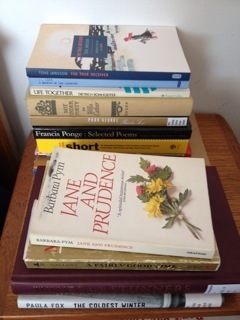 I’ve discovered over the years that poetry works as a fine centering device between books. Right now I have Robert Hass’ The Apple Trees at Olema on my nightstand. Poetry collections are not meant to be read front to back. I open it somewhere in between the covers (remember, I said nightstand) and read a handful of his singular insight and I find myself back to square one where I can jump in to any book. It doesn’t mean I’ll finish it, but it will get a fair shake. It works, give it a try, you’ll read more poetry, and you get to dust off those thin volumes languishing among the novels. Who took a picture of my nightstand? The Pym, Jansson, Carr and Ponge titles currently reside there. Loved this essay. I laughed over “book shelf staring” which is one of my favourite activities when between books (other than reading web-sites about books). It’s easier than one thinks. First, consider carrying on w four or five books cotemporaneouslz. Then, pick one random book by Banville (preferably The Book of Evidence), start in on The Southern Reach Trilogy (it has this “this-is-what-i-should-be-reading” feel, blistering prose X w/ ingenous plotting), face down Infinite Jest and steel yourself for the sexist stretches in Salter. That’s All There Is. On a serious note: Yes, it’s impossibly hard to make up one’s mind, there’ll always be a number of tomes staring down on you, antipathetically, from the frigid heights of the shelve. Peake, Bolano, langurous Loetscher, bloody Bellow, Morrison, Kraszna-hawkeye, fresh-as-ever Frisch, et al. Meet their cold regard as you would Moira’s with those eternal words on your lips: hodie non, canis! I feel quite certain that The Goldfinch is one of those monu-bloody-mental disappointments that leads to the type of cognitive dissonance that would make you paper over your lover’s worst, belatedly revealed, homicidal character flaws. He didn’t disappoint either: the first couple of paragraphs throw one’s imagination into war’s stupendous maw. Of your descriptions, I mostly rely on a combination of “shoulds” and bookshelf staring. I find it interesting that I can bypass the same book time after time, only to have it grab me unexpectedly and not let me go until I reach the last page. I often let the book I’m currently reading guide me to my next book. Sometimes I’ll find something that’s tonally or thematically similar, although occasionally I actively choose something dissimilar (I steered clear of epic post-modernist fiction for a few months after finishing Infinite Jest). Particularly for non-fiction, I’ll pick a tangential topic of my current book that I’d like to focus on in depth, and the choose based on that. A very strange thing happens when you do buy some books or take them out of the library. As soon as you get them home you wonder why you wanted to read them. And when you go into the library or bookshop without particular books in mind immediately your mind is empty of names of any author you might possibly want to read. I use the leap-from-flagstone-to-flagstone approach. One book always suggests another. Not to mention all those pesky bloggers who keep finding books for me. about a writer who decided to read a whole shelf in the library (LEQ-LES). Nice reflections too about the pleasure and value of reading.